Great Condition Inside and Out. Runs and drives, just Perfect. Very economical with a 6 speed manual gearbox and low profile. Only covered 20k miles with full service history and has just been serviced ready for the season.. Thatcham alarm, remote cl, elec mirrors, cab air con, cruise control, twin rear view cameras (rev and monitor), cd/radio, tv aerial and tow bar with removable ball hitch. 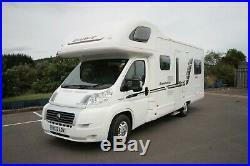 2x 3 point forward facing passenger seat belts making this a true 4 berth motorhome. 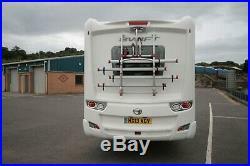 Fiamma 4 x bike rack. Fiamma wind out awning/canopy and elec step. 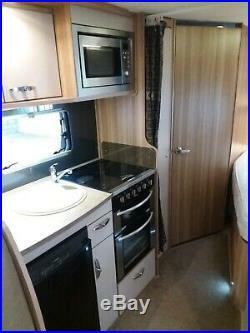 Very spacious and light inside with a full size oven with separate grill, 3 gas burners and 1 electric ring. Dometic Absorption 3 way fridge freezer and microwave. Lots of lockers, cupboards and hanging closet. All habitation windows, skylights and door are complete with blinds and fly screens. Fully fitted press studded carpet with the choice of vinyl underneath. Large washroom with electric toilet, sink, shower and screens with lots of mirrored cabinets and cupboards. French style bed with storage underneath and also housing the Truma electric/gas combi boiler, which is also accessible from an outside locker. Half dinette with the 2 forward facing, belted bench seating, with lots of storage underneath. 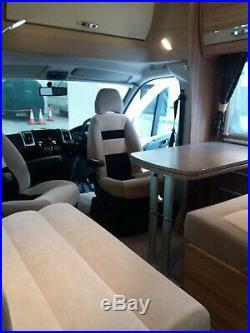 Nearside bench seating with more storage underneath and incorporating the leisure battery. 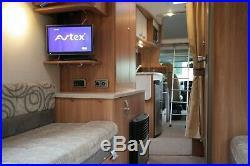 The Dinette and side bench make up the double berth. 2 fully swivelling captains chairs with another large locker above in the cab. 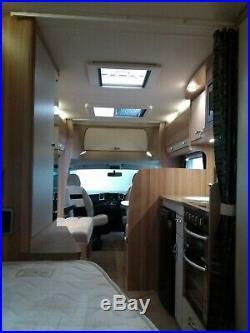 12v and 240v sockets tv and aerial point, led lighting, onboard water tanks, central heating etc. The main control unit above the hab door monitors the power sources, all battery levels and charging, waste and fresh water tanks and the hot water and heating. There are a couple of marks to the exterior that can be seen in the images that we inherited from the previous owners, one is below the n/s rear window and the other is on the o/s at the top rear corner which we found to be not too detrimental to its overall visual appearance. 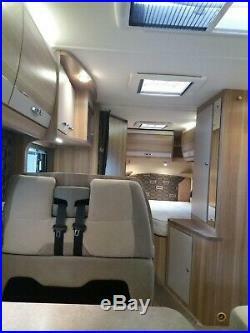 The motorhome needs to be seen to really appreciate the great condition it is in. 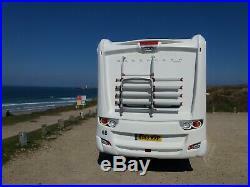 Included is a few extras such as, hook up cable, hose, fittings, ramps, blocks and gas bottles etc. Also available separately is a very light (no poles) Oxygen Porchlite awning, which has only been used for 3 days and is in as new condition. 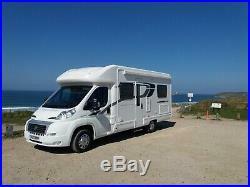 It slides into the Fiamma wind out canopy, pumped up, pegged out and is set up in minutes with ease. 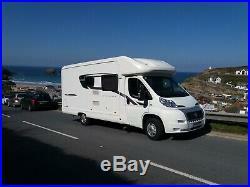 The Motorhome is in Hayle, Cornwall in covered storage. Thank you for your time and if you require anymore images, or any questions, or would like to view, please ask. 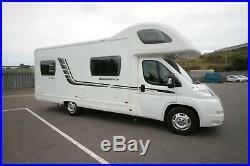 The item “2013 Fiat, Swift / Bessacarr E454, 4 Berth Motorhome with 4 Seat Belts” is in sale since Wednesday, April 17, 2019. 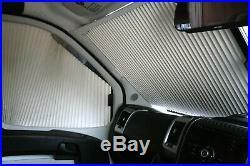 This item is in the category “Cars, Motorcycles & Vehicles\Campers, Caravans & Motorhomes\Campervans & Motorhomes”. The seller is “falmouthsailing” and is located in Redruth. This item can be shipped to United Kingdom, United States. Great Condition Inside and Out. Runs and drives, just Perfect. Very economical with a 6 speed manual gearbox and low profile. Only covered 20k miles with full service history and has just been serviced ready for the season.. Thatcham alarm, remote cl, elec mirrors, cab air con, cruise control, twin rear view cameras (rev and monitor), cd/radio, tv aerial and tow bar with removable ball hitch. 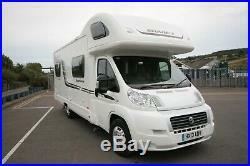 2x 3 point forward facing passenger seat belts making this a true 4 berth motorhome. Fiamma 4 x bike rack. Fiamma wind out awning/canopy and elec step. 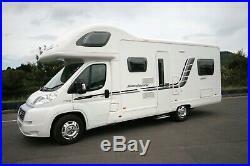 Very spacious and light inside with a full size oven with separate grill, 3 gas burners and 1 electric ring. Dometic Absorption 3 way fridge freezer and microwave. Lots of lockers, cupboards and hanging closet. All habitation windows, skylights and door are complete with blinds and fly screens. Fully fitted press studded carpet with the choice of vinyl underneath. 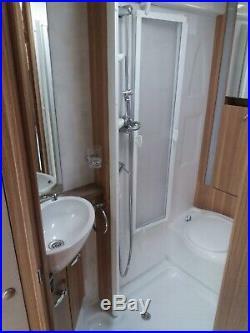 Large washroom with electric toilet, sink, shower and screens with lots of mirrored cabinets and cupboards. French style bed with storage underneath and also housing the Truma electric/gas combi boiler, which is also accessible from an outside locker. 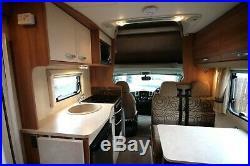 Half dinette with the 2 forward facing, belted bench seating, with lots of storage underneath. Nearside bench seating with more storage underneath and incorporating the leisure battery. 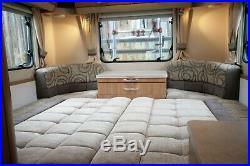 The Dinette and side bench make up the double berth. 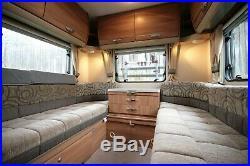 2 fully swivelling captains chairs with another large locker above in the cab. 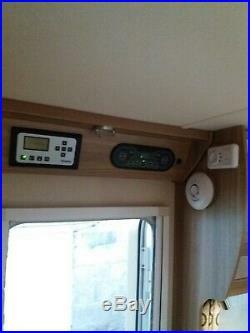 12v and 240v sockets tv and aerial point, led lighting, onboard water tanks, central heating etc. The main control unit above the hab door monitors the power sources, all battery levels and charging, waste and fresh water tanks and the hot water and heating. There are a couple of marks to the exterior that can be seen in the images that we inherited from the previous owners, one is below the n/s rear window and the other is on the o/s at the top rear corner which we found to be not too detrimental to its overall visual appearance. 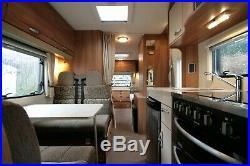 The motorhome needs to be seen to really appreciate the great condition it is in. Included is a few extras such as, hook up cable, hose, fittings, ramps, blocks and gas bottles etc. Also available separately is a very light (no poles) Oxygen Porchlite awning, which has only been used for 3 days and is in as new condition. 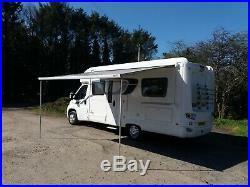 It slides into the Fiamma wind out canopy, pumped up, pegged out and is set up in minutes with ease. 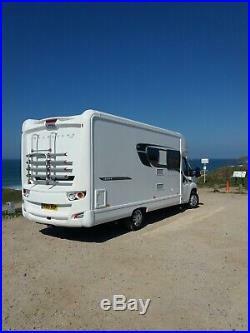 The Motorhome is in Hayle, Cornwall in covered storage. Thank you for your time and if you require anymore images, or any questions, or would like to view, please ask. 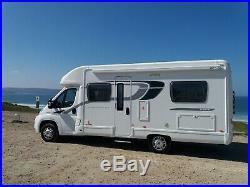 The item “2013 Fiat, Swift / Bessacarr E454, 4 Berth Motorhome with 4 Seat Belts” is in sale since Sunday, April 7, 2019. 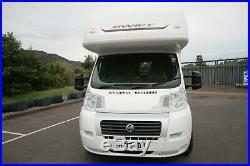 This item is in the category “Cars, Motorcycles & Vehicles\Campers, Caravans & Motorhomes\Campervans & Motorhomes”. The seller is “falmouthsailing” and is located in Redruth. This item can be shipped to United Kingdom, United States.